Agricultural habits are among the worst offenders when it comes to pollution. 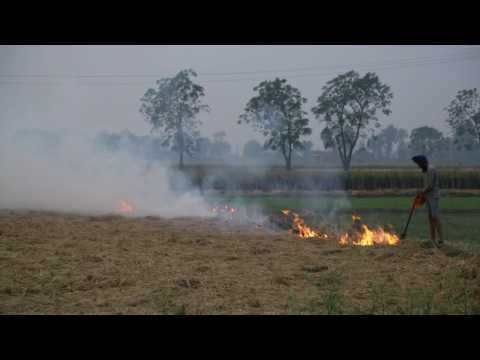 In India, stubble burning - or the setting on fire of the straw or organic waste left behind after a field's harvest - is common practice. In the state of Punjab, a vast agricultural plain in the vicinity of the capital New Delhi, thousands of fields are burning... while the population is suffocating. Drones were used to spray cotton fields with pesticide in Xinjiang, covering an area of more than 400,000 hectares. Farmers benefit significantly by replacing manual farming with machinery as drones are able to cover 40 times the area a human would be able to spray in a single day. 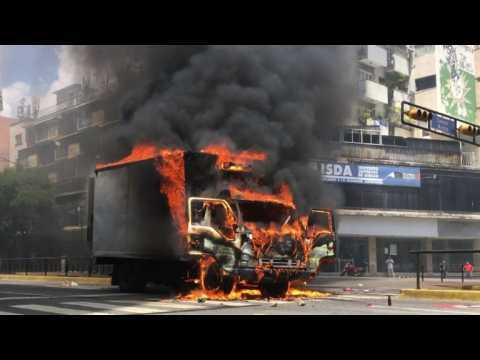 Opposition activists set a truck on fire to block an avenue during an anti-government protest in the Venezuelan capital , in defiance of President Maduro's intentions of rewriting the country's constitution. Ford Motor Co is expected to announce the departure of Chief Executive Mark Fields in a broad management shake-up, a company source said - a move that reflects growing investor unease over the company's stock market performance and outlook. Forbes and the New York Times reported that James Hackett, 62 and chairman of the Ford unit that works on autonomous vehicles, would take the helm. An announcement could come as early as Monday. Ford shares are down nearly 40 percent since Fields, 56, took over three years ago, at the peak of the U.S. auto industry's recovery.